Nitrogen packaging is one way of preserving food without affecting its flavor or texture. It is perfectly safe and won’t do any harm to the consumers. At Paxiom Group, all our models of vertical form seal machines can be upgraded for additional inclusions. Therefore, one of which is the nitrogen flush, which is used for nitrogen packaging applications. Our VFFS machines include The VerTek series and The XPdius series. All in all, we have 5 nitrogen packaging machines. The first two is the VerTek 800 and 1200 that can produce a maximum of 12 inches wide of pouch—depending on the model—and produce a variety of shapes and sizes including stick pack, pillow, and gusseted pouches. Constructed with a single piece of 304 stainless steel frame, both models have a neat finish and is built to allow more room for easier maintenance and cleaning. It promises to offer high-quality service with its easy-to-remove pull belts and jaw assembly, and a tool-less removable former. Our VerTek machine are capable of forming, filling, and sealing laminated, metalized or polyethylene materials. It is designed to promote precision when sealing with its simplified swiveling mount. The essential parts are also positioned at the front offering easy accessibility and visibility for the operator. Third is the VerTek 1600 sporting its conventional design for easy set-up, operation and, maintenance. It can run on polyethylene and laminate materials like all other VerTek bagger models. Engineered for large bag applications, the VerTek 1600 can produce a wide selection of pouch styles as wide and long as 16”W x 18”L. 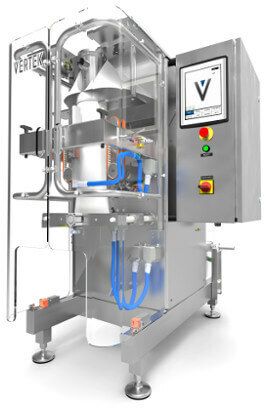 Then we have our last VerTek bagger, the VerTek 2400 that is designed for bulk packaging applications. This machine is built to provide for serviceability, clean-ability, and ease of use to its user. It can produce large pouches up to 24 inches wide and 36 inches long in a variety of styles and offer low maintenance costs due to its off-the-shelf parts. Finally, we are down to our last nitrogen packaging machine, the high performance XPdius i-130. It is designed for high-speed applications and is known to reduce the cost of ownership. Thanks to its tool-less feature, this VFFS machine will save you time. Loading film, replacing pull belts and bag width changeovers are easier. It is built to enable the operator to have a better access to the frame. Lastly, XPdius i-130 is operated by two Panasonic servo motors and vacuum pull belts that will keep the acceleration, deceleration, and positioning optimized.